Fischer projections provide a simple 2-dimensional representation for complex 3-dimensional structures. Which is great for drawing complex molecules, but not so much fun if asked to determine R and S configurations. Many books and professors will have you redraw the Fischer projection into a 3-dimensional sawhorse or skeletal structure. I find this to be a waste of time and source of needless confusion on exams. This video shows you how to quickly and easily find R and S configurations directly on the Fischer Projection. Guaranteed to save you time on your next stereochemistry quiz/exam. In fact, if it DOES save you time come back to this page and let me know by leaving a comment below. 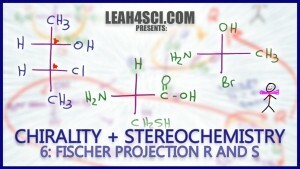 This is Video 6 in the Chirality/Stereochemistry Video Series. Click HERE for the entire series. Leah You are a Great Great Teacher!!!!!!!!!!!!!!!!!!!!! God Bless you!!!! Seriously I only learn from your videos! I’m happy these have helped you, Anfisa! GREAT VIDEO! why can’t I watch the swap method video though? Wish you were my instructor. I get that often! I do offer tutoring and a Study Hall membership! Your the great keep on!!!!!! Thank you! Keep on, Keepin’ on! That video was clear and concise. Thank you for all that you do!